Pakistan is home to the ancient Gandhara Civilization. Its Buddhist character, which this civilization is best known for, was first established in the late 19th and early 20th centuries when colonial British military men and archeologists discovered various ancient religious sites near the city of Taxila in the Potowar region of Pakistan. 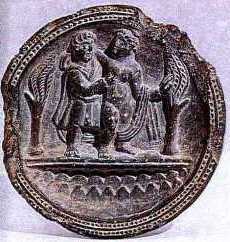 However since independence of Pakistan, the late 20th century studies and research conducted both by the Pakistani and Western scholars have documented and confirmed that Gandhara Civilization was not always Buddhist in character but had also gone through some well defined Hellenistic and Parthian periods as well. 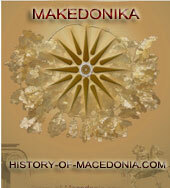 The Hellenistic period of Gandhara starts with the arrival of Alexander the Great of Macedonia in 329 B.C. After conquering Taxila in 327 B.C. he remained in the areas now constituting Pakistan for another two years until his return via Indus Valley, Arabian Sea and Makran Coast also in Pakistan. 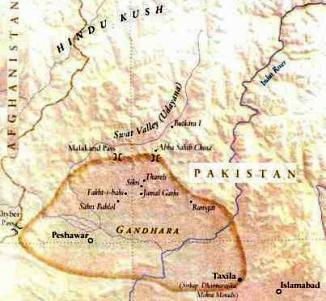 The ancient Gandhara proper consisting of the Peshawar Basin of Kabul River and Upper Indus Valley, along with the sister communities of Udayana in Swat, Pakistan and Bactria in north east Afghanistan has come to be known as the Greater Gandhara. Prior to the Greek arrival, thanks to its location on the now famous Silk Road, the area had already become one of the economically most prosperous regions of the world. 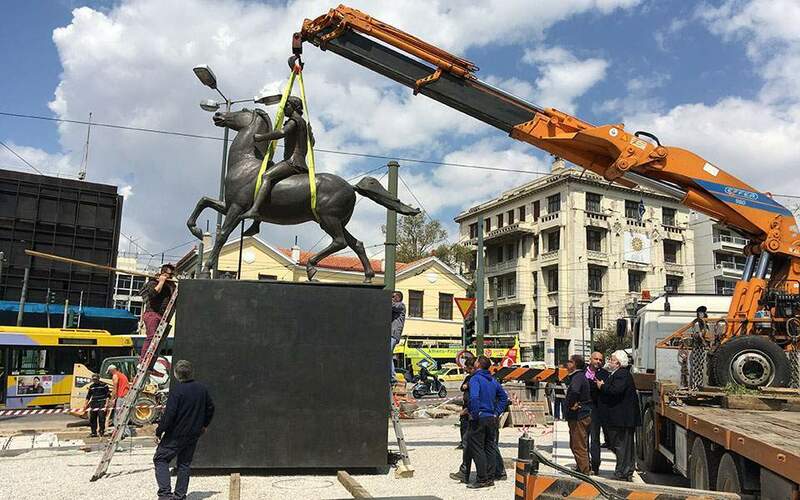 But the Greek conquest brought such significant cultural, economical, political and religious changes to the Greater Gandhara region that historians and anthropologists are now more than ever inclined to call the three subsequent centuries following the Alexandrian invasion as Hellenistic (330 B.C.-129 B.C.) and Parthian (247 B.C.-224 A.D.) periods of today’s Pakistan and Afghanistan. As a result of the Greek conquest politically the region became part of the Alexandrian Empire stretching from the Eastern Mediterranean to the Indus Basin. 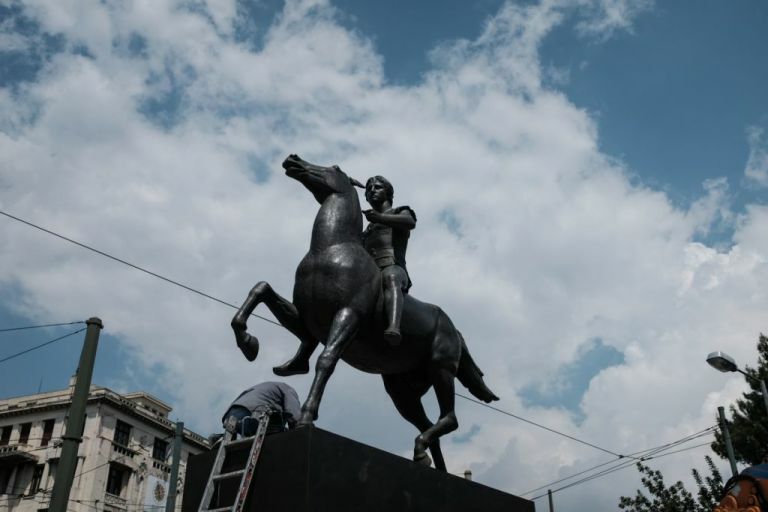 Before his return Alexander installed his various generals as local kings of the conquered territories. A string of kingdoms were established from one end to the other end of the empire even though Alexander who died in year 323 B.C. did not live long enough to taste the fruits of his exploits. Soon after his death, a local upstart of humble origin named Chandra Gupta Maurya was able to set up a kingdom in the Indus Valley. 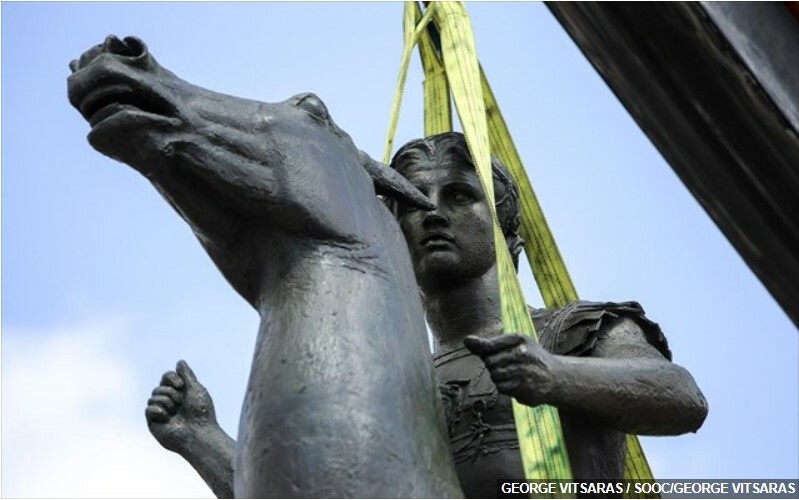 Seleucus, a general of Alexander, unsuccessfully tried to win back the lost territories (306/305 B.C.) but the counterattacks of the Mauryans forced the Greeks to retreat towards Bactria. Later his grandson Ashoka stretched the empire from Afghanistan to Bengal with Pataliputra (Putna, India) as its capital. Ashoka converted to Buddhism and under his patronage Taxila gained further prominence. But the Mauryan empire died with Ashoka in 231 B.C. 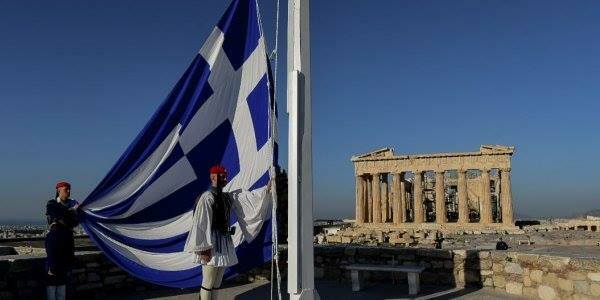 and Greeks under the leadership of Demetrius made a come back to reclaim Greater Gandhara. Economically the Alexandrian invasion brought trade routes from the Eastern Mediterranean to Gandhara-the gateway to China-under Greek control. 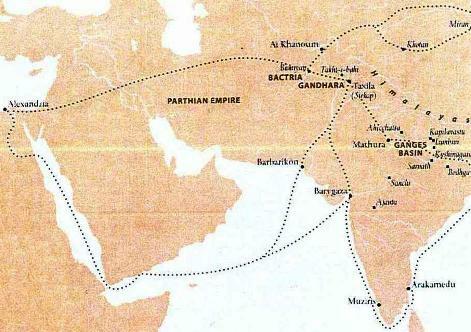 The most significant change was the opening of a second trade route. Sea ports like Alexandria, Egypt and Barbarikon near Karachi, Pakistan became important economic hubs. Under Greek protection commercial ships from Alexandria via the Nile River, Red Sea, Arabian Sea and lower Indus River would travel all the way up to the present day city of Multan, Pakistan with goods en route to China; further adding to the prosperity of the Greater Gandhara. 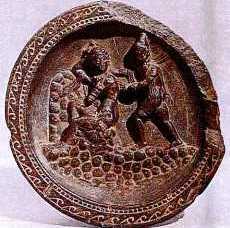 Culturally and religiously the Greek arrival added one more layer to the Gandharan diversity. 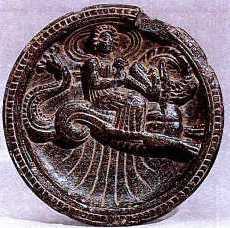 Even though under Ashoka Buddhism had officially arrived in Gandhara, but still with the exception of monasteries and rock edicts commissioned by him, there have been no discoveries of Buddhist iconology as symbols of popular religion of that period. On the other hand the popular artifacts discovered from various sites near Taxila, and identified as belonging to the period between 3rd. century B.C. and 1st. century A.D., show Hellenistic and Parthian but not Buddhist characters. These carved stone pieces such as dishes and slabs, statuettes and other objects were made of schist, phyllite and steatite and are now part of a larger Samuel Eilenberg Collection housed in the Metropolitan Museum of Art, New York. 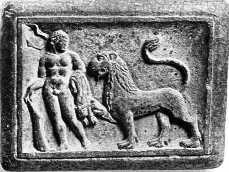 Carved Greek mythical gods such as Apollo, Aphrodite, Daphne; characters such as wrestler Heracles and Nemean lion; symbols such as floral wreaths and grape wines regularly appear in these objects. The Buddhist icons discovered from ancient Gandhara sites, under latest studies are now dated as belonging to the post Greek and Parthian 1st century A.D. and later periods. 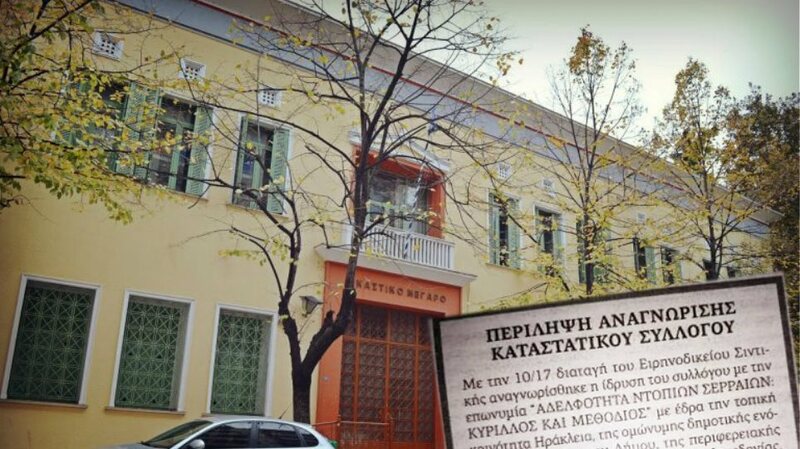 Greek period is marked by the distinct Hellenistic styles of town planning, western art and architecture, coinage and iconology, Greek language and personal drapery. 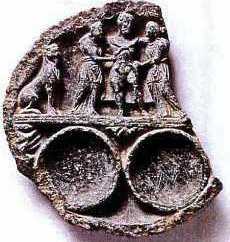 From Greeks the political control of Greater Gandhara successively passed on to the Shakas, Parthians and Scythians. 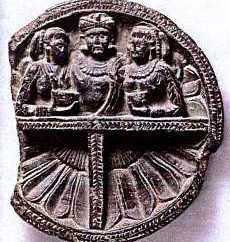 Parthians who had established a vast Second Persian empire stretched from Caspian Sea in the north, Mesopotamia in the west and Indus in the east considered Greater Gandhara as their domain and essential to their control of East-West trading routes. In the Mediterranean region the political power had passed on to the Romans. Even though Parthians and Romans continuously fought with each other, together the two empires controlled the land and sea trade routes between Europe and China. 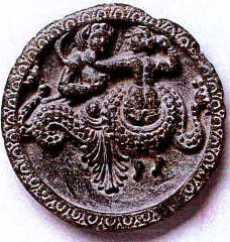 Under Parthian rule the Greek style and symbolism in Gandharan artifacts gradually fades out and is replaced by the Parthian cultural influence. First century A.D. marks the end of Hellenistic and Parthian periods of Greater Gandhara. Kushans, a nomadic tribe from Central Asia took control of Greater Gandhara and Indus Basin and then marched on to the Ganges Valley in North India. 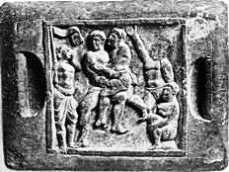 Kushans unlike Greeks and Parthians patronized Buddhism originating from the Ganges Valley as the state religion and thus set in the Buddhist period of Greater Gandhara that lasted until 6th and 8th centuries A.D. in present day Pakistan and Afghanistan respectively. Curator and Author, Kurt A. Behrendt.